Lanyards provide a great way to show your ID badge prominently at all times. There are several types of lanyard available. Breakaway lanyards are a good idea for those who work in the medical field, at schools, for children, and for anyone that works with machinery. The breakaway feature is a safety feature that will disconnect should the lanyard become caught on something. You will find many different colors of breakaway lanyards available to meet your needs. A round lanyard is small and quite durable offering a unique design to the traditional lanyard. If you are looking to make things shine a bit, consider one of the rhinestone lanyards that are available. The rhinestone lanyards are available in four different colors, red, purple, pink, and blue and will really stand out in a crowd. Customizing a lanyard with your company information is a great way to market your brand. Lanyards make great giveaways for customers and for event attendees. Every time someone wears the lanyard with your logo or company name imprinted on it you are receiving free advertising. 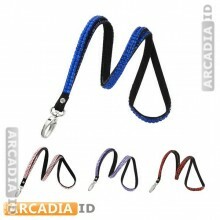 When choosing lanyards you will also need to consider the type of attachment to use. There are different clip styles available that offer different features. Some attachment pieces will require that you punch a hole in your ID card while others will simply clip onto the ID badge. You can choose which one will work best for your particular needs. If you have any questions about customizing lanyards or about ID card printing and accessories in general feel free to contact us by phone at 855-MAKE-IDS (855-625-3437) to speak with one of our friendly customer service representatives. You may also email a member of our sales team at [email protected]. You may also find the information that you are looking for at our website ArcadiaID.com.